Dubai, composer Shaan Rahman and lyricist Manu Manjith’s ode to the Malayali El Dorado is short, sweet and extremely heart-warming. The arrangement is kept simple, riding largely on the mandolin/banjo hook and Liya Varghese’s vocal harmonies. Suchith Suresan and Vineeth Sreenivasan deliver the lead vocals equally well. Composer Shaan Rahman also gives Vineeth Sreenivasan a second melody Ee Shishirakaalam, one where he is joined by another competent singer Kavya Ajit. The melody is excellent, as is the composer’s wont, and the background features some brilliant violins from Cochin Strings. Thiruvaavaniraavu, as evident from the title, is an Onappaattu, and is made adequately Malayali-sounding both lyrically and musically (a touch of arabhi raga perhaps), albeit with a smattering of synth elements. Sithara Krishnakumar does a fine job behind the mic along with another voice rarely heard these days, Unni Menon (and additional vocals by Meera Scharma). It could be the presence of the leading men from Kochi band When Chai Met Toast – singer Ashwin Gopakumar (who is also lyricist here) and guitarist Achyuth Jaigopal – that lends Home a pronounced indie sound. A fab movie debut for the twosome; Ashwin’s words and singing convey the nostalgic feel to a tee, while Achyuth provides splendid support from his end. Ennilerinju is the only track that digresses from the soft melody format which dominates Jacobinte Swargarajyam’s soundtrack. Of course, here too Shaan lays a melodic base through Cochin Strings, but what hooks you to the song is the well-executed rap-carnatic jamming between Rzee and Sithara Krishnakumar. Jacobinte Swargarajyam. 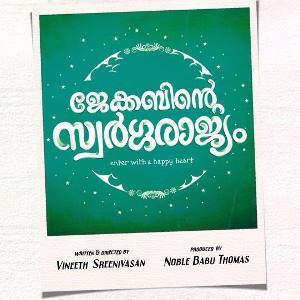 A melody-heavy soundtrack and Shaan Rahman delivers, as he always has – in the genre, and particularly for Vineeth Sreenivasan. All Songs and Background Music Composed, Programmed and Arranged by Shaan Rahman. All Songs recorded at ‘Shaanz Eternal Ray’, Cochin and ‘Freddy’s AVG’, Cochin.